The Birdsong Identiflyer is the easiest way to identify and learn the bird songs you hear. Simple place a song card into the slot and press the button next to the image of the bird to hear its song. Two cards, 20 songs, are provided with each player. 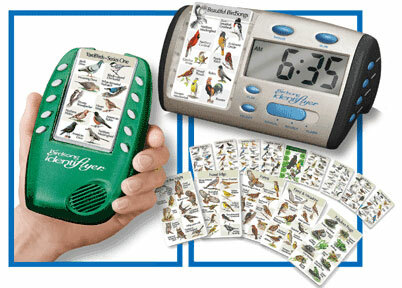 With the Birdsong Clock, you can awaken each morning to the song of your favorite bird, or use the clock just like the Identiflyer to help learn and identify the songs of the birds you hear. Visit the Birdsong Identiflyer web site for additional details and other song cards.